Almost a year ago, a few veterans of World War II in a group, spoke about a veteran’s organization in the St. Stanislaus Parish It did not take long before a committee headed by Stanley Kugaczewski got the ball rolling. He actually did all the work in forming and organizing the St. Stanislaus Memorial Post 1771 American Legion. The Post is named in honor of the many members of the Parish who gave their lives in the last two great conflicts. It is a living memorial to the heroes of the St. Stanislaus Parish. On September 28, 1949 the first meeting of the Post was held in the St. Aloysius Club rooms on Driggs Ave., where the Post Charter was signed by all members present. Today, the Post is well organized with a membership which is steadily growing. Meetings are held at the St. Stanislaus Hall, 2 Newell St. every second Monday of the month. A drive is now underway for new members. Did you sign up? If not, please do. On Sunday February 26, 1950, a Memorial Mass will be sung at the St Stanislaus church at 11 A M. In memory of our departed comrades. The members of the Post invite the next of kin, wives, mothers, fathers, sisters, brothers, relatives and friends of our departed heroes, to be present at this Memorial Mass to pray for their souls. Also all the parishioners are invited to participate in this Memorial to pay tribute and homage to their departed friends. Massing of the Colors will be at 10:30 A.M. in front of St. Stanislaus Hall, 12 Newell St. Route of parade will be Newell St., Nassau Ave. Humboldt St to church. At the Mass the colors of the Post will be blessed by Rev. Joseph Studzinski, Pastor of the Parish. After the Mass, Post Commander Stanley Kugaczewski will place a wreath on the Memorial in front of the St. Aloysius Club. Taps will be sounded, then the parade will proceed to the Post Quarters. When World War I came to a close on November 11, 1918 there was great rejoicing in all the homes in the land except the ones that lost their dear loved ones. It was the same story also when in 1945; World War II veterans began coming home to their families they left behind in 1941 and later years. The Parish of St. Stanislaus Kostka was one of the leading parishes in the Diocese of Brooklyn which gave so many of her sons to the Service, the number of men in the different branches of Service amounted to a little over 1,500. But all of these young men did not return home. Yes, over fifty of our sons and brothers gave their lives so that our great nation should still maintain its democratic form of government. We hope they did not die in vain. Many of the returned veterans spoke about a veteran’s organization honoring the many departed comrades in the Parish. 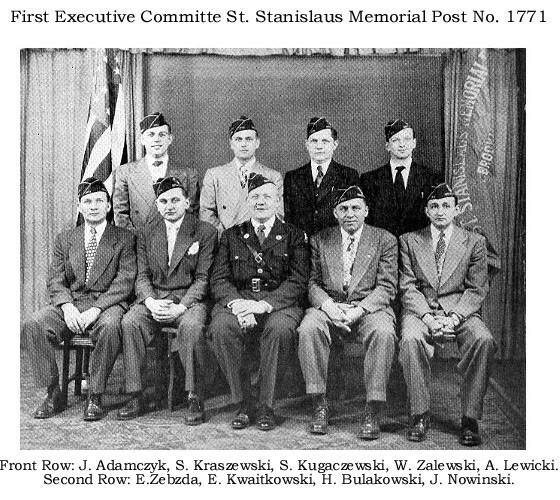 The work was hard and slow but eventually through the efforts and untiring zeal of Stanley Kugaczewski, the St. Stanislaus Memorial Post 1771, American Legion finally became an organization. The first meeting was held in the clubrooms of the St. Aloysius Club on September 28, 1949. At this very historical gathering two important tasks were performed. The highly prized charter of the Post was signed by the members present, and the first staff of the organization was elected which consisted of Stanley Kugaczewski, Commander, Alexander Lewicki, Stanley Kraszewski, Walter Zalewski and Joseph Abramczyk, Vice – Commanders, Rev. John Kowalski, Chaplain, Edward Zebzda Adjutant, Joseph Nowinski, Finance Officer, Henry Bulakowski, Service Officer and Historian, and Eugene Kwiatkowski, Sgt-at-Arms. Right at the first meeting, things began to hum. Plans were made, committees organized, so that in the first year of its existence the St. Stanislaus Memorial Post got to be known in the: Community as well as at the Headquarters of the American Legion in Kings County. On Sunday, February 26, 1950, the first Memorial Mass was celebrated and the colors of the Post were blessed by the Rev. Joseph Studzinski, Pastor of the Parish. The ceremonies were well attended and the church filled to capacity. Over fifty Posts were represented with their colors, making this our first function a great success. Then throughout the year, the colors of the St. Stans Post were present at many Legion functions and Memorial Masses in Kings County. The sale of Poppies was a greater success than was anticipated thanks to the fine cooperation of the members and there friends. The first dance tended by the Post drew a record crowd at the Parish Auditorium thus making the first affair a great success financially. In the Memorial Day Parade, the St. Stans Post drew first plate in the 12th Division placement in the line of March. The Pulaski Day parade also saw the Post at the head of the Greenpoint Division. Came the Parish Picnic and Parish Bazaar and you have seen comrades of the St. Stans working zealously to make both affairs the success they turned out to be. At Graduation Exercises in June and January you see the; Poi awarding medals and certificates to winners of the best essays on Americanism. Yes, this act has been greatly approved by many in helping the youth of the Parish to realty understand his or her part in this great Nation of ours. Still thinking of the youth of the Parish, the Post organized a committee headed by Vice-Commander Kwiatkowski to institute a Youth Program. It has the blessing of the Pastor of the Parish, and with the cooperation and fine spirit of the parents of our younger generation this endeavor will be a great success. I personally know, the boys will enjoy the fine sports such as baseball, basketball and football and going on hikes, etc. We ask your fine cooperation. Won’t you please give this a little thought and help this fine organization? The climax of one year of success in the Parish and community was the presentation of the Permanent Charter. This happened on Wednesday, February 21, 1951, when County Commander Judge Matthew J. Troy, presented the Post with its newly prized document, the Permanent Charter. At the impressive exercises Commander Troy lauded the work of the Post Commander and his fine staff in their untiring efforts to make the Post one of the leading Posts in the County of Kings. So today April 15, 1951, we the entire staff of officers and membership thank all those good people who helped make our past endeavors a great success and hope you will keep the St. Stanislaus Memorial Post 1771, American Legion, in mind. The present officers of the St. Stans Post are: Stanley Kugaczewski, Commander; Stanley J. Kraszewski, Vice-Commander Taddeus Kwiatkowski, Vice-Commander; John Koza Vice-Commander; Edward Kugaczewski, Vice-Commander; Rev. John Kowalski, Chaplain; Joseph Nowinski, Finance Office Henry M. Bulakowski, Service Officer; Henry Markowski, Sgt-at-Arms; Executive Committee: Stephen Sikorski, Stanley Manski, Edwin Brady, Zeno Domasiewicz and Casimir Kaftanski. Membership is steadily increasing. Meetings are held every second Monday of the Month at the Post Headquarters, 12 Newell St., Brooklyn. On Sunday the second annual memorial mass of St. Stanislaus Memorial Post, No. 1771 American Legion, was offered in St. Stanislaus Kostka R. C. Church at 11 A.M. The celebrant was the Rev. Victor Bozoska. The sermon was, by Father Minkiel C. M. of Erie; Pa: Holy pictures, obtained through the courtesy of DeKarski Funeral Home were distributed to those attending the mass. Following the mass there was, parade to McGoldrick Park where Past County Commander James C. Varley placed a wreath at the base, of the monument erected to the hero dead of World War I taps were sounded. The parade, continued to the memorial for World War II in front of St. Aloysius Young Men’s Catholic Club in Driggs avenue. Here past County Commander Daniel T. Tobin placed a wreath at the base of the memorial. Short addresses were made by’ Post Commander Stanley Kugazewski; Past County Commander, Thomas Callahan, and 12th, Division Commander Teddy Wisniewski. Participating were members of more than 40 veteran posts. They brought with them their colors. At the close of the exercises refreshments were served in the headquarters of the post, 12 Newell Street.